‘My name is Rhoda Laurent, a resident of Namagondo village. I am 33 years old and a mother of three children, a daughter and two sons. My main occupation here is small scale agriculture. But I am also doing tailoring after receiving my basic training in Misasi Misungwi district in 2004. Now I am one of SIDO/TFSR project’s beneficiary for three years. 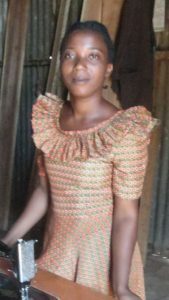 In 2016 I received more training in tailoring at SIDO office in Mwanza and then I was provided with a sewing machine which we were told came from TFSR. In fact I am now so good in this trade that I have a group of trainees some of them coming from distant villages to be trained at my place. I have had two sewing machines before but they are not of good quality. This one I got from SIDO last year is really good and I am very happy that today I manage to get the treadle base since it was just in the box at my home. I hope it will help a lot in improving my work as it seems to be of very high quality and professional. Tailoring pays a lot. Since I have been engaging in this trade I have managed to buy a plot and build my own house. However the big challenge I am facing is lack of adequate capital to buy modern types of clothing material to cope with current situation. There are enough customers here since it a ward center and there are a number of institutions including schools and health facility which provide good market for the clothes I make. There are also few competitors since there are only a few numbers of tailors who can make clothes of the quality that I am making. Please pass my greetings to SIDO staff and our friends in Europe.